2-Shinners; Nature Center Field Trip. Musical at the Sharon Lynn Wilson Center Friday & Saturday (2 shows). District 1 Tournament @ AMF West. Musical at the Sharon Lynn Wilson Center Saturday (2 shows 3pm & 6pm). This is for crew only and takes place at the Sharon Lynne Wilson Center. This rehearsal takes place at the Sharon Lynne Wilson Center. This is Weight Training. It is being held in the upstairs weight room. Please contact BCHS Guidance - Greg Groh w/questions Grohg@elmbrookschools.org. Incoming 2019-2010 Kindergarten Information Night -- January 29 @ 6 p.m.
K-5 Weather Assembly by CBS58. This rehearsal is for both cast and crew and takes place at the Sharon Lynne Wilson Center. 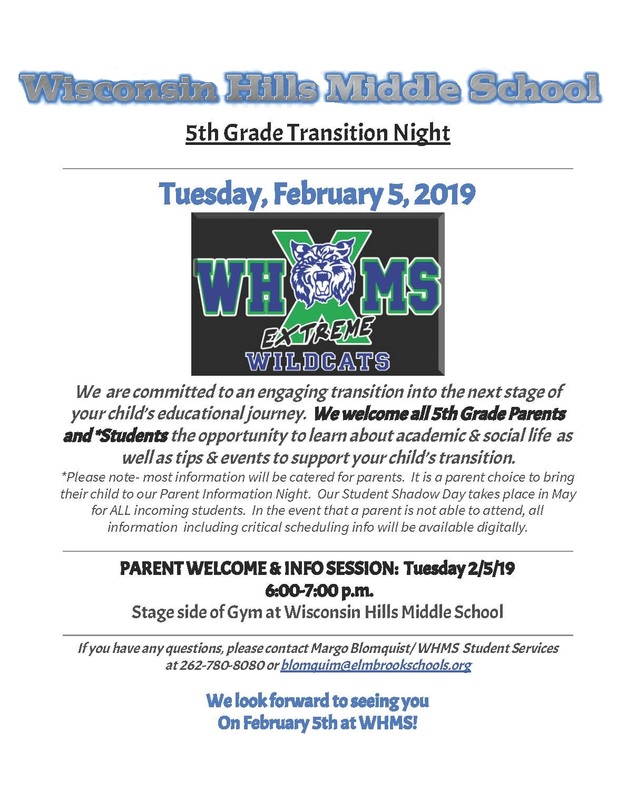 Parent of current 5th Grade students starting 6th grade next year - Welcome and Info Session located in Stage Side of WHMS Gym. Incoming 6th Graders for 2019-2020. This rehearsal is for cast and crew and takes place at the Sharon Lynne Wilson Center. New Date: Wednesday, February 6th 3:00-5:30 at WHMS. Please join us on February 5 from 5:30 to 7:30 (new times) for Dixon's Annual Empty Bowls & Literacy Night. For current 8th grade students planning to attend BEHS. The event is held in the Field House. AMC 10 Math Competition In School Field Trip Please see Julie Wessel for information. PPMS is hosting South Milwaukee. Singles Sectionals - must qualify/be invited @ AMF West. The musical is performed at the Sharon Lynne Wilson Center.